For National Black Forest Cake Day, March 28th, we deconstructed the Black Forest Cake (photo #1), inspired by the dessert (photo #2) at Compère Lapin in New Orleans. 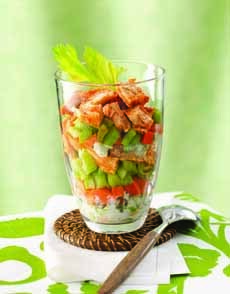 We had so much fun with it, that today’s tip is: Deconstruct one of your favorite recipes. An individual chocolate round covered with ganache. A side of morello cherries in kirshwasser (cherry liqueur). A scoop of cherry sorbet atop a bed of flakes of grated chocolate. We like the deconstructed even better than the traditional. It’s elegant and sophisticated, as opposed to the old-fashioned layer cake with whipped cream. The richness of the chocolate ganache added an intense chocolate hit, lacking in the original. The morello cherries in kirschwasser added just the right counterpoint to a sweet dessert. Serve it with a liqueur glass (or snifter, or jigger) of kirschwasser. Take a slice of chocolate pound cake, chocolate sour cream cake or even a brownie. Top with the Red Sour Cherry Topping from Chukar Cherries (or a quality cherry pie filling) cooked with kirschwasser, and a generous topping or side of whipped cream. A conventional Black Forest Cake (photo courtesy Sweet Street Desserts. Black Forest Cake deconstructed, at Compère Lapin restaurant | New Orleans. 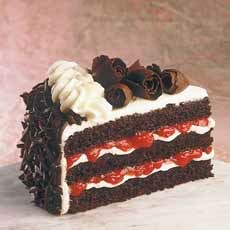 There’s more about Black Forest Cake below, including its origin and a link to traditional recipes. Hervé This, the “father of molecular gastronomy,” reintroduced the concept in 2004 as “culinary constructivism.” Essentially, all of the components and flavors of a classic dish are taken apart and presented in a new shape or form. Deconstructed pecan pie could be brown sugar custard [emulating the filling], with crumbled shortbread cookies [for the crust] and a side of caramelized pecans. Deconstructed key lime pie could be the key lime filling in a Martini glass, topped with graham cracker crumbs. Deconstructed stuffed cabbage is our favorite way to make stuffed cabbage. We’ve done this for some 25 years—who knew we were so avant garde? We slice the cabbage and cook it in the tomato sauce (sweet-and-sour, with raisins and vinegar) along with rice-filled meatballs. The deconstruction saves hours of blanching cabbage leaves, filling them with chopped meat and rice, rolling them and simmering in tomato sauce. All the flavors are there, and it’s also easier to eat: One often needs a steak knife to saw through those blanched cabbage leaves. We say: Our deconstructed version is better than the original. 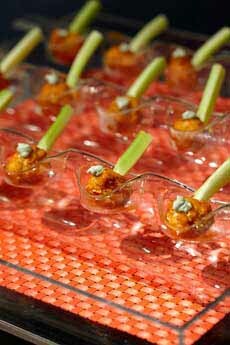 Two ways to deconstruct Buffalo Wings:  as a parfait (Hungry Girl) and as a chicken meatball topped with blue cheese (Carlos Andres Varela Photography). Study these for ideas. When you’ve created your own masterpiece of deconstruction, send us a photo. The Black Forest region of southern Germany is known for its sour morello cherries and kirsch, or kirschwasser, a clear cherry brandy made from them. 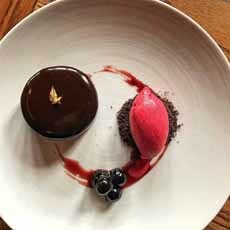 It’s not surprising, then, that desserts made with both the cherries and the kirsch are part of the regional repertoire. Black Forest Cherry Torte—torte is the German word for cake and Schwarzwälderkirschtorte is its name in German—is a chocolate layer cake filled with layers of whipped cream and Kirsch-soaked morello cherries. The cake is garnished with more whipped cream, morello or maraschino cherries (the latter more readily available in the U.S.), and chocolate curls or shavings. In the traditional German cake, the chocolate layers are soaked in kirsch syrup, although brandy or rum can substitute. American recipes tend to omit all spirits to make the cake family-friendly (and nowhere near as interesting). The earliest version of the recipe possibly dates to the late 16th century, when cacao ground from costly New World beans was first integrated into cakes and cookies. The first “Black Forest Cake” was probably not a conventional cake but a dessert comprising cooked cherries, cream, kirsch and a biscuit: similar to the original berry shortcake.One of the quintessential Old World desserts, Black Forest Cake transports us to eras past, when the thought of chocolate cake, cherries, liqueur and whipped cream were a dessert equivalent of heaven.If you want to make a traditional Black Forest Cake, here’s a recipe.